Everyone loves helpful hints – Hook It & Cook It! I hope this post finds all of you readers well! I recently took at 4 1/2 hour (turned 6 hour thanks to toddler puke and traffic) road trip to Pennsylvania and was able to do lots of crocheting in the car. I made sure to pack lots of yarn, patterns and tools. I’d like to share with you some things that I packed and find super helpful. They are common things that you can find around your house; no need to go to the craft store or buy special products. Their uses might be somewhat intuitive, but I’ll expand upon them anyway. Here we go! Now, the first item is by far one of my favorite things. It is the common chopstick. I use it all the time for crocheting, but also for tons of other things around the house (stirring coffee so it won’t scratch the bottom of the mug, tethering small houseplants that need support, getting magnets and crayons out from under the stove, it’s endless!). I will specify that I like the packages that have 2 “individual” chopsticks in them as opposed to the kind that you have to break apart. They have a nice tapered tip, are round from end to end, and are much smoother. These are great for pushing stuffing into animals through small openings and adjusting the stuffing once it is inside (think getting it into corners and such). I also use them to spread apart stitches a little before I set the posts for safety eyes as well as the ends of tassels. I will also tell you that when you buy a package of fiberfill and it says “stuffing tool included”, it is another way of saying “there is a wooden stick in the bag”. Next is a tiny, sharper relative of the chopstick, the toothpick. 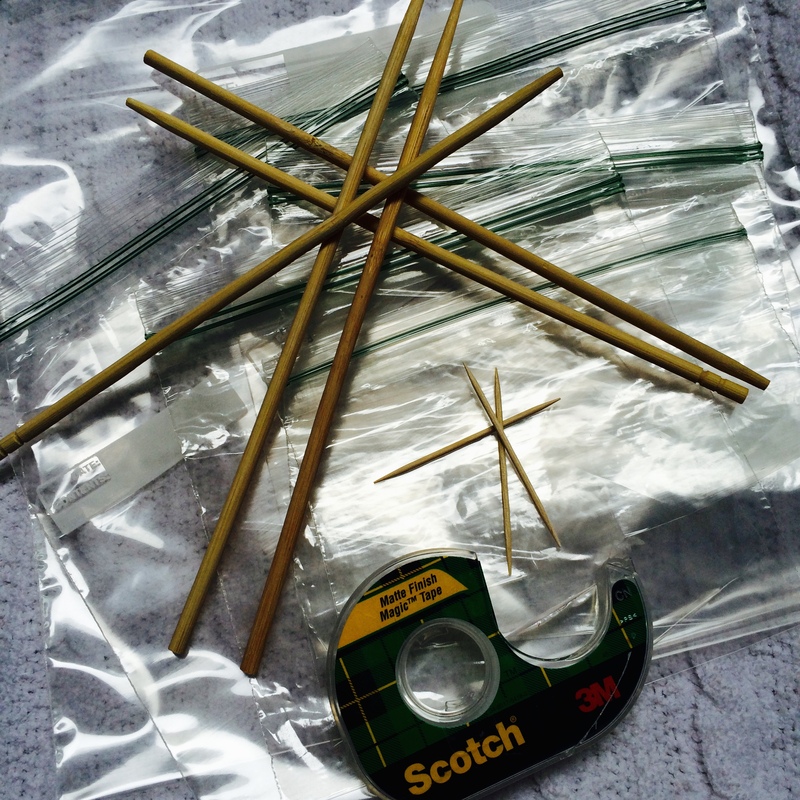 I keep this in my tube of needles and use them for pushing in the woven ends. 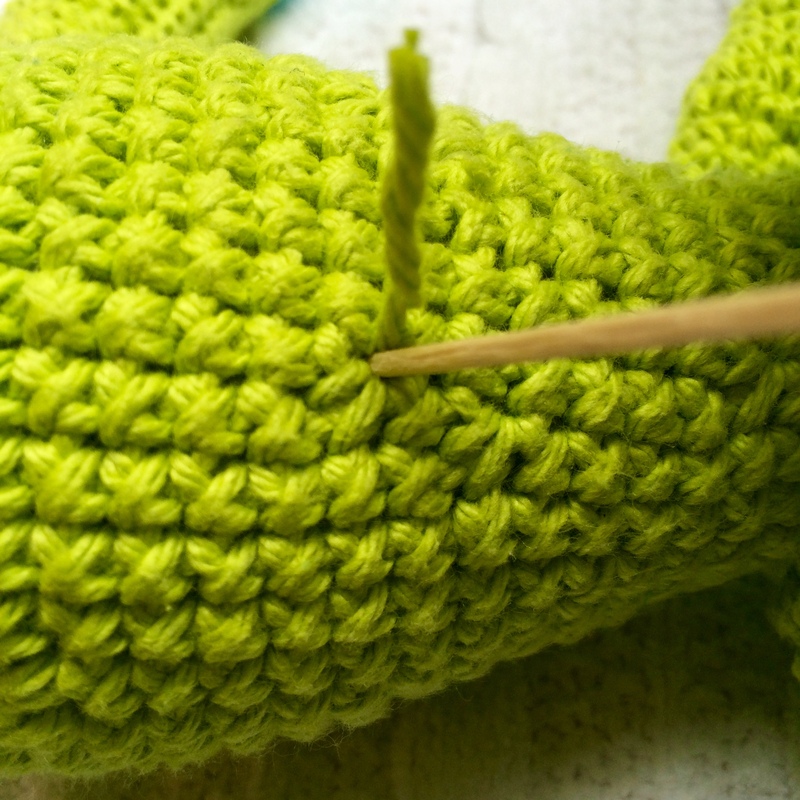 The chopstick works for this task too, but it does it a little quicker, easier, and doesn’t open as much of a space in the stitches. Number three is the ziplock bag. I’m sure this one is self-explanatory, but I’ll give some examples anyway. I use all sizes, and for similar reasons. When crocheting stuffed animals, you typically crochet all the individual pieces before assembling them. I use a gallon ziplock for each work-in-progress to keep the pieces organized. Putting them in a bag also keeps them from getting dirty, snagged or lost. There is usually enough room to keep both the pieces as well as the balls of corresponding yarn. Below is a a picture of two works-in-progress. The left bag is ready to become and owl, and the right is finally ready to shape up into a purple elephant! 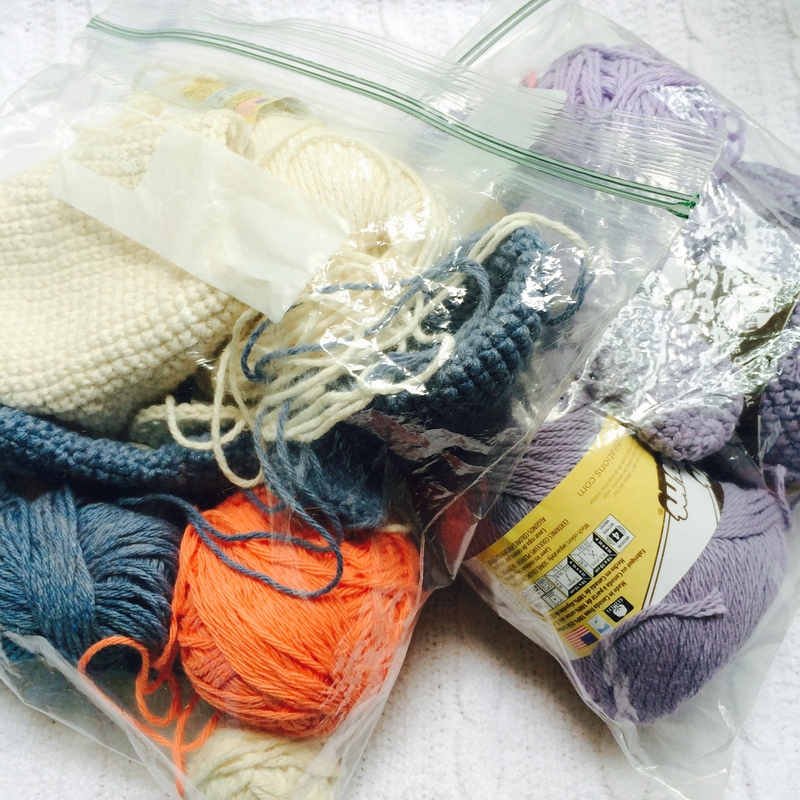 I also use small ones (quart, sandwich and snack, depending on the yarn ball size) to keep yarn clean and tangle free. 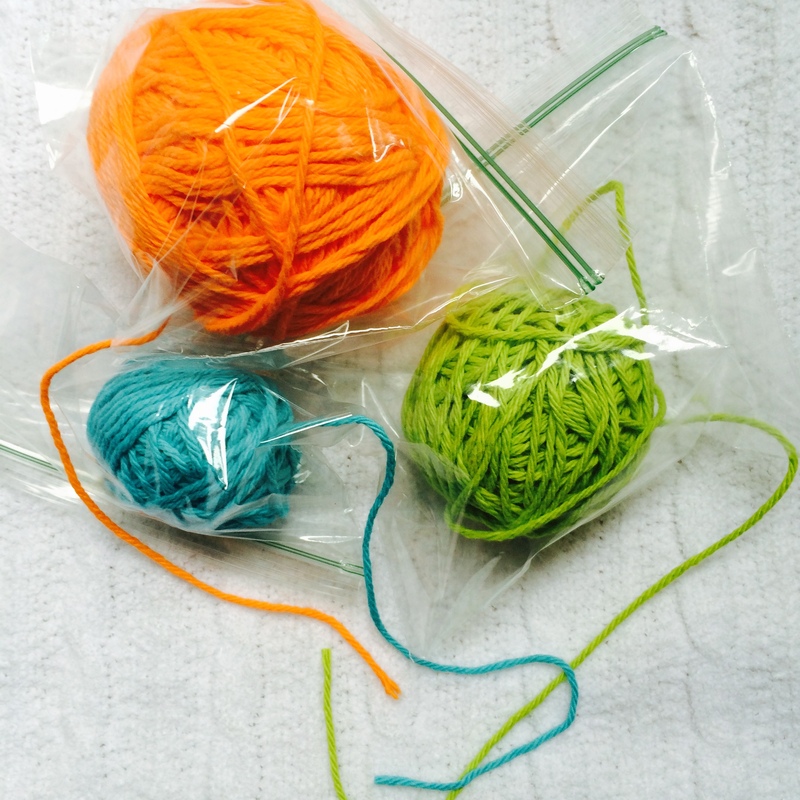 Simply ball the yarn, place in bag, zip close and snip off one of the bottom corners. Pull the yarn end through the bag and you have a moldable, wipeable, disposable yarn dispenser. You can even write the color/brand/dyelot on the outside directly on the bag for future reference. Use masking tape for labeling and you can reuse the bag again. Last but not least, tape. Now, I don’t use this one as often, but it has made my life much easier several times. After pieces have been put together, the ends need to be woven in. 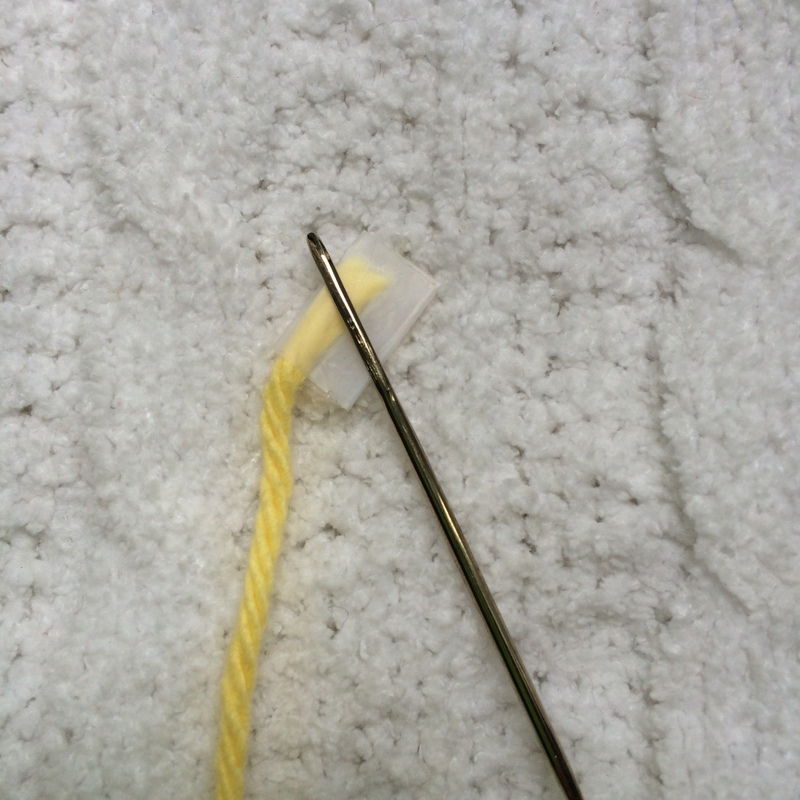 A tapestry needle makes the job fast and efficient. However, sometimes all the individual fibers of the yarn start to split, thereby making it difficult to thread a needle. This is where the tape comes into play. Take a small piece of tape, place the end of the yarn on it and fold over several times (don’t roll it or you will get a tube shape, defeating the purpose of the tape). Pinch the end and make it flat. This will then easily slide through the eye of a needle and voila – threaded! Well, there you have it. A few household items that can keep your projects clean and organized and make some tedious tasks a little easier. The next post will be food related for my non-crocheting readers, so I’ll be sure to give you a heads up. Cheers! One never knows when you’ll be stuck with nothing to do! Been there right? Previous Previous post: Hell hath no fury….